Exhaust fans are an essential safety feature in any commercial kitchen. The fans, along with the exhaust hood, filters, and ductwork, help to vent smoke, steam, odors, and heat from the kitchen area. They are also responsible for collecting and trapping airborne grease particles. Here are some tips on how restaurants should maintain exhaust fans for safety and regulatory compliance. 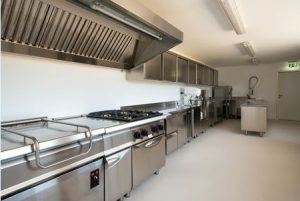 The National Fire Protection Association publishes standards for fire suppression and ventilation in commercial kitchens. According to these standards, exhaust fans and related exhaust components must be properly inspected and cleaned at regular intervals. The frequency of inspection and cleaning depends on the type or volume of cooking that is done at the restaurant. The frequency can be as often as monthly for solid fuel cooking operations or as infrequent as yearly for low-volume cooking operations like churches or senior centers. The standard that is used for exhaust system cleaning is “bare metal.” This applies to the exhaust fans, hoods, ducts, and filters. Systems that are very dirty may require multiple cleanings to remove all grease and sludge. Access doors are essential for properly inspecting and cleaning a kitchen exhaust system. Unfortunately, some systems may have inadequate access doors which makes it more difficult to properly inspect and clean the system. The responsibility for proper exhaust system inspection and cleaning typically rests with the owner. This means that the owner of a restaurant should not only have the mandatory maintenance performed, but should also take care to use only qualified and properly insured contractors. The cleaning contractor should provide the restaurant owner with a signed inspection certificate that details what areas were cleaned and, if applicable, any areas that could not be accessed. Dynamic Fan specializes in commercial and industrial fan sales, installation, maintenance, and repair. Contact us today (https://www.dynamicfan.com/contact-us/) at 973-244-2422 to learn how we can help with your exhaust fan system.